By LUDWIG VON KOOPA - Golfing, anyone? Welcome to the beginning of a long line of strategy guides for KoopaTV's amazing browser-based Flash game, The Wonderful 1237! The Wonderful 1237 features seventeen unique minigames, all from each of the seventeen Republican presidential candidates you will be competing with. As explained in last week's Wonderful Wednesday article about those minigames, I'll be writing these strategy guides — one for each candidate, in a specific order. This one is about the guy who ultimately won the whole thing in real life: Donald Trump. 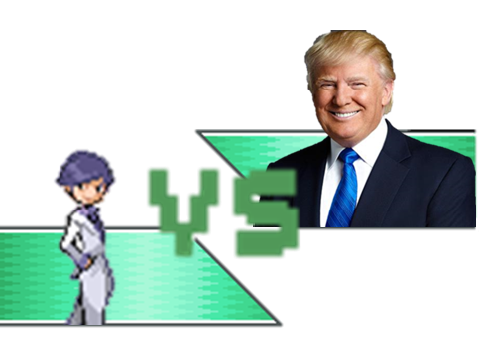 As of the game, he's Candidate Donald Trump — one of many other candidates. However, as you can see below, he's among one of the more formidable candidates — though perhaps that will become more obvious as you compare him to others. By LUDWIG VON KOOPA - What do we think of this moral dilemma? And on one corner, we have the forces of JonTron and the “alt-right”! And on the other corner, there is the game developer Playtonic and the radical leftist videogame board, NeoGAF! The current controversy of the week is this: Popular YouTuber JonTron, who has three million subscribers on YouTube (it's unknown how many of them are actually active), said really dumb/questionable/noble-but-poorly-articulated things in a political debate about culture, immigration, and race, with some left-wing guy. The substance of that issue doesn't matter to this discussion, but the end result is that JonTron, who is a (bad) entertainer, tried pretending like he's some kind of political thinker and it backfired. As a result, it divided his fanbase up. By LUDWIG VON KOOPA - Some overarching game design stories before I write specifically about each minigame. I think the most technically awesome thing about The Wonderful 1237, which is a free browser-based Flash game that can and should play right from KoopaTV, is that it has seventeen awesome minigames incorporated in it. They just barely are able to be crammed in this jam-packed game, but they're there, modularly programmed, and self-contained. Those are all good programming principles. 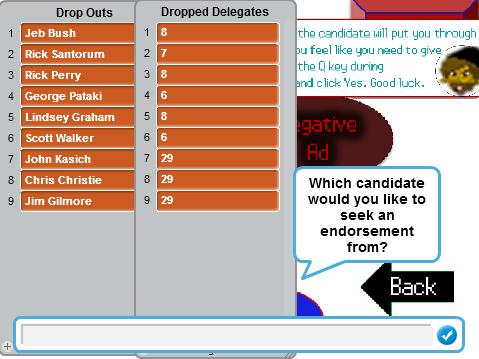 The list of dropped-out candidates after Iowa and New Hampshire in a particular playthrough. If you want their delegates, you'll have to play a minigame. Where'd I get the idea to make a minigame compilation? (Well, The Wonderful 1237 is a lot more than that, mechanically, but the minigames is where a bunch of the development time went.) Am I going to provide a list of the minigames in here? (Yes.) What design philosophies did I have when making them? All of those will be answered, and more. Last week for Wonderful Wednesday — the article series where I try every week to write something about KoopaTV's free, fun, and browser-based game The Wonderful 1237 — I discussed how the Aesthetics of The Wonderful 1237 provided learning points about how the presidential primary process in the United States is treated as a horse race, and how detrimental that is to America. This week, let's look at what the game's inner mechanics, and the dynamics (how the player interacts with it), can teach us. And by us, I mean you. Though I myself learned quite a bit about the subject matter through making this light-hearted “simulation”. Game development for learning! Making America Great: Abolish Daylight Savings Time! I am so incredibly grumpy. Yesterday, March 12, was one of the worst days of the year. In the top 3. There's Daylight Savings Time day (yesterday), Tax Day (April 18 this year, usually April 15 — and we'll have an article for it when the time comes), and then my birthday (December 13). All are awful. 134,926 messages sent as of tonight. You can add your name here. I've decided to take my opposition to Daylight Savings Time, shared by everyone on KoopaTV's staff, a step further this year. By LUDWIG VON KOOPA - A total lack of substance from the media, which directed the narratives. I absolutely highly recommend reading these two articles from the Harvard Kennedy School Shorenstein Center on Media, Politics, and Public Policy: Part 1 covering the Republican and Democratic presidential primaries from beginning to the end of 2015, and Part 2 covering the Republican and Democratic presidential primaries from 2016 to their conclusion. They're fantastically written, and serve as all of the background you'll need if you weren't following the presidential primary season of 2015–2016. And shame on you if you weren't, since KoopaTV did. 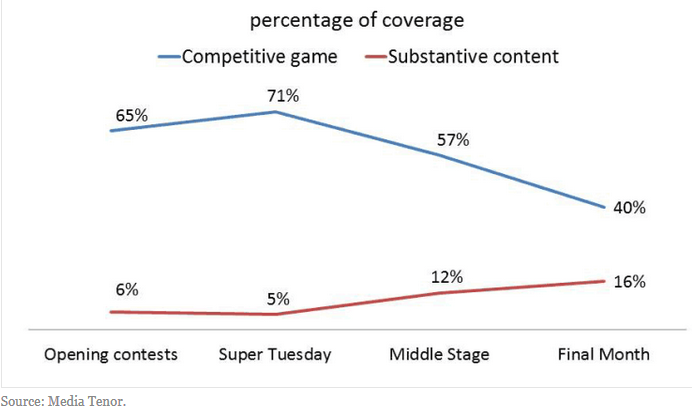 The conclusion is that the media — the gatekeeper of information between what was going on in politics (and the candidates) and you, the American voter — is institutionally unable to provide coverage on what is actually important (issues, substance) and instead focuses its coverage on “horse race” style reporting: Who is winning/losing in the polls, and how the day's events will change that. This is because of the values of news organisations (talk about whatever is... y'know, new and exciting). There's little discussion on actual merits of policy. It got to the point that Slate.com literally has a horse-racing animation with the candidates, and other websites had similar things going on at the time. 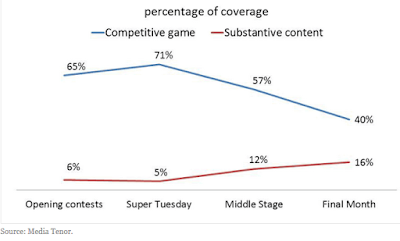 The percentage of media coverage on the horse race vs. substance. Note how it's the reverse of what's helpful for voters (you want substance to be able to decide early). This figure provided in Part 2 of the Shorenstein Center's analysis. By LITTLE FRUINI - Now you're learning with power! 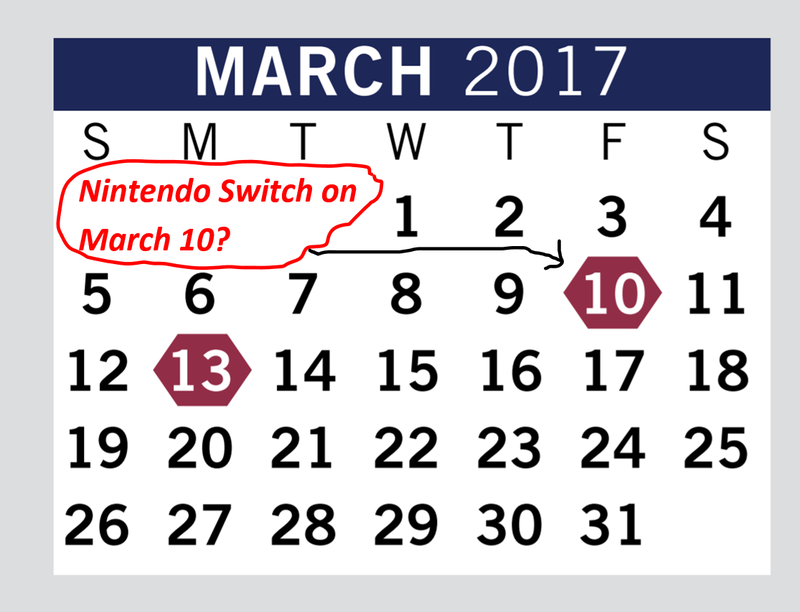 The Nintendo Switch launch has been anticipated for a very long time, ever since the existence of the NX, codename for the Switch, has been revealed. People have created an NX Bot, bugged Zelda Williams, and the formerly-known /r/NintendoNX subreddit had gone full on haywire before the reveal (there were tons of Tomorrow posts over there)! Which is why, as an enthusiastic Nintendo fan, it HURTS that I had to actually WORK on Friday instead of being enclosed in a house filled with adventure… and isolation. It hurts in the same way when Nintendo switched the Super Bowl game (pun ever-so intentional)! Here is a calendar of a student’s March schedule. The red hexagons indicate free student days. 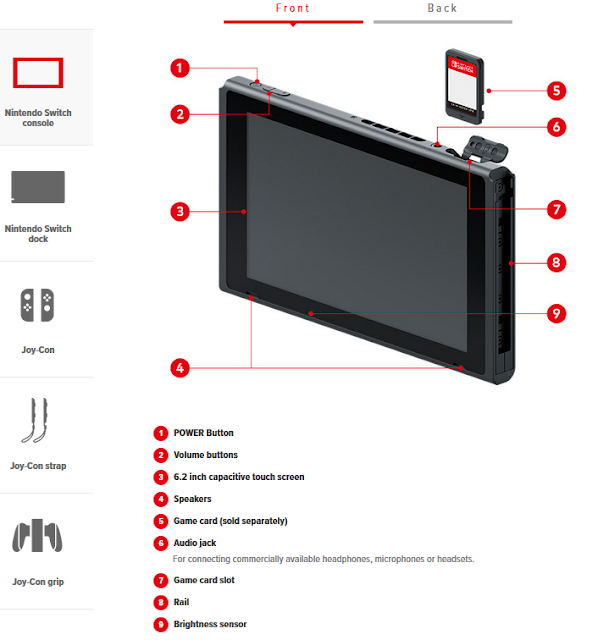 Now, there’s a new problem: Getting the Nintendo Switch itself. By LUDWIG VON KOOPA - ...Then congratulations. You're SPECIAL. It turns out that the reason Nintendo chose the Imagine Dragons song “Believer” for their Super Bowl LI commercial is because of all of the PAIN involved in the song. 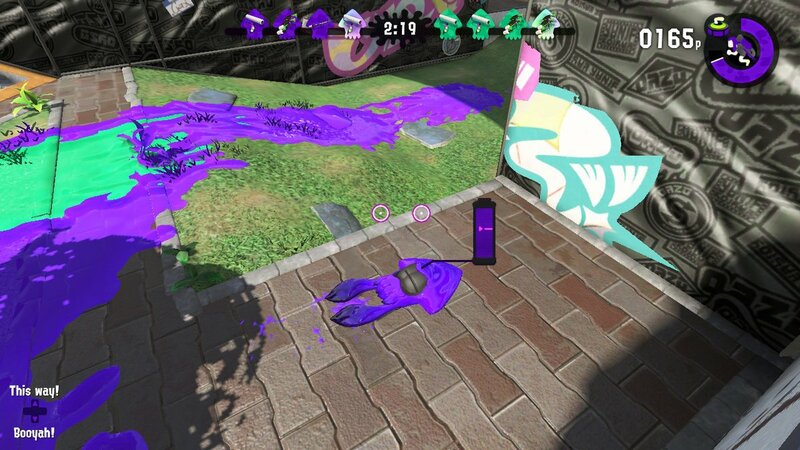 They were foreshadowing the agony in actually acquiring the JUST-LAUNCHED-TODAY Nintendo Switch! ...so approximately how long will it take me to find a Switch? 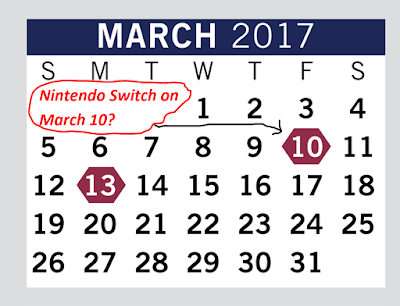 KoopaTV's never done a new Nintendo console launch before, so if there's supposed to be a ritual involved, I'm not aware of it. Anyway, despite only having The Legend of Zelda: Breath of the Wild and a handful of other titles at launch (like Snipperclips and “Cow-Milking With 27 Bonus Minigames” 1-2-Switch), that's enough for the Nintendo faithful to want to purchase a Switch. I guess that means they all chose the Nintendo Switch version of The Legend of Zelda: Breath of the Wild according to my article about which version to buy! Yet, evidently lots of people bought The Legend of Zelda: Breath of the Wild for the Wii U, according to how active its Miiverse community is. Why? Can they not afford a Nintendo Switch... or do they want one, but could not actually get one due to inventory issues? There are many reports and stories out there about many different retailers, ranging from Best Buy to Amazon, cancelling or delayed pre-orders. If you haven't pre-ordered, then the high demand is just making these inaccessible. Sounds familiar, right?